Afro-Soul With A Conscience Climbs the World Music Charts In time for Black History Month, the Berlin based Afro-Soul band, Black Heritage, talks about how they met and what inspires them after years performing and writing music together. Reinhard Katemann, MFA Kera, and Mike Russell make up the Afro-Soul band Black Heritage. Mike Russell, from Washington D.C., MFA Kera, from Madagascar and Senegal, and Reinhard Katemann, from Germany, make up the Afro-Soul band Black Heritage. "It's very important to participate in Black History month," Mike Russel says. "There's still a long way to go in the African-American community. I've had friends that have lost sons and daughters to violence. And you start to figure, have people gotten used to it? It's not something to get used to." The group's members, an African-American, an African, and a German, respectively, have diverse personal journeys with backgrounds in funk, gospel and classical music that has led to a unique blend of Afro-Soul music with a conscience. "I grew up in the bush," Kera says. "I always loved nature and music. I saw really misery. For example, in Madagascar we lost 90 percent of our rainforest, and I think for Black History month it is an emergency to add the ecology and the sense of responsibility for our children." Mike Russell says their work is a continuation of this music. "This idea of combining and fusing this music which we've done from the beginning going back to the 90's." Russell is the guitarist, Mfa Kera the vocalist, and Katemann the keyboardist, arranger and producer. The band has represented Germany at the Smithsonian Museum, performed in Central Park in New York for the UN Peace Vigil in 2009, and at the Kennedy Center and Blues Alley Jazz Club in Washington D.C.
Their latest album "Talking Africa" climbed to number 23 in the European World Music Charts last year. "I think it's a new step for us with this CD," Kera says, "and I think right now is Black History month, and it fits perfectly. We're gonna keep on. It's a message to give courage." Kera and Russell do much of the songwriting together. The lyrical themes cover social issues they feel need to be urgently addressed. Mfa Kera has worked with such luminaries as Louis Armstrong, Duke Ellington, and Lionel Hampton and Memphis Slim. 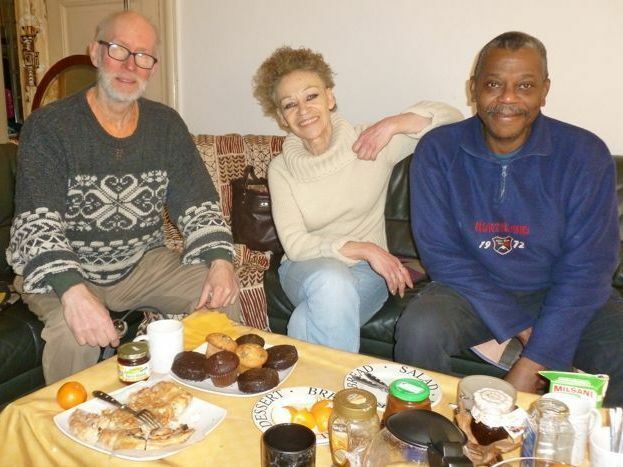 She had already met and worked with Katemann in Los Angeles in the 1980's, but it took a chance meeting with Mike Russell in Berlin a few years later for Black Heritage to come about. "I was on my way to a club, and then I met Mike who was going to another club to play. I went to see him, and I loved what he was doing." The band's name was Kera's idea. "I really lived in fabulous environment between Christians, Muslims and animists, and become really just like Mother Africa, universal in your thoughts, in your feelings, in your spirit." Mike Russell says they would like to tour more and inspire audiences everywhere. "I would like them to take a positive message of tolerance, love, respect and to honor life. Let the music take them to a positive place, and I hope this music can bring them there. I want people to know that Black Heritage talks about all people, that it includes everyone. That's why Reinhardt is sitting there. We've been working together 20 years, and he's part of it. Black History month is for all people."